The only way to survive during hard times is to face it with no fear. You should know that it’s absolutely normal to have hard times and be ready to fight for your happiness. Hard work is very exhausting, but it doesn’t matter how many days or nights you’ll spend doing your work, because after you succeed you’ll rest on your laurels for many-many days! Depression is a thing almost everyone goes through, so don’t be afraid to ask someone for help. The golden rule for people suffering depression is to stay open and tell your troubles to your friends and family. 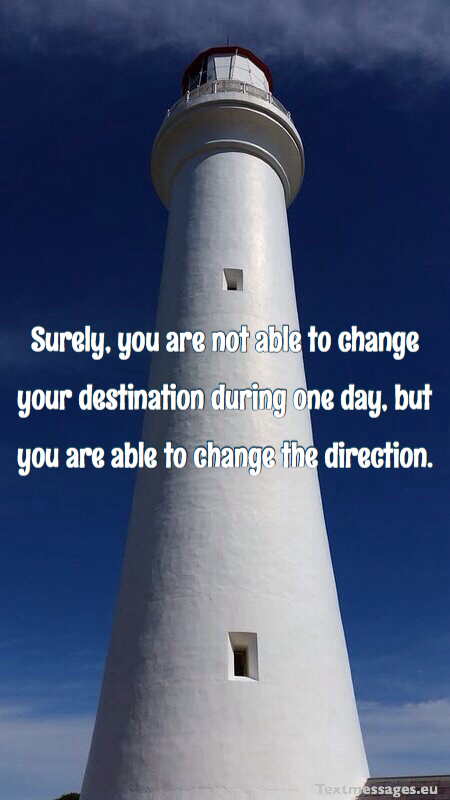 Surely, you are not able to change your destination during one day, but you are able to change the direction. Good days come suddenly, when we don’t expect them to come. And it what makes us doubly happy. So don’t despair and you’ll see that bad times will end very soon. Just a little patience. The hardest part is to start. But when you start, this would grow easier for you to move on day by day. Life gives hard times only when it’s sure you will cope with them. So you should feel like a blessed person, because life thinks you’re strong enough. Show it that you are. Why should you stay in this depression? You have to move on no matter what. Negative won’t lead you to anything good, so you should try to turn it into a positive. It’s better to make an effort and move on. If you don’t see any light, it just means that it’s somewhere ahead and you’ll reach it very soon. Just keep going! If you think that your life is not fair, because it doesn’t help you to achieve a satisfying result in you work, just wait a little. It tests you to see if you deserve it. Prove you’re worth it, never give up! Everything has its price. And you’ll never know true happiness if you give up without even making an effort. Keep going and you’ll see that it wasn’t all for nothing. If you don’t see light at the end of the tunnel, it’s not the end of the world – it’s just hard times. You will handle it, just a little patience and faith. Moving on is a path to happiness. If someone left you, fine, let them leave and make room for something better. The best is yet to come! Every time when it seems to you that there are no reasons for keep going, just look around. The world gives you many beautiful reasons to fight for your life and every single day. Keep going! Hard work is worth your sweat and every injury, because it gives you experience, teaches you a lesson and eventually all your expended efforts will be justified. Just wait a little bit. Fight for your dreams, never let anyone break you down by saying that you can‘t do something. Depression is something you have in your mind, but you can change it. Just smile to your life and it will eventually get tired of hurting you! The key word in “hard times” is “times”, because time has a way to slip through the fingers like sand. It flies very fast, so don’t be afraid that these hard times are here for long. People are often afraid of moving on, they think it’s too difficult. But the truth is that when you move on things get a whole lot better, so never be afraid! Even when you think that you have nothing to live for, you still have something to live and fight for. It’s your future self, your dreams, your friends and family. They are worth living for, aren’t they? 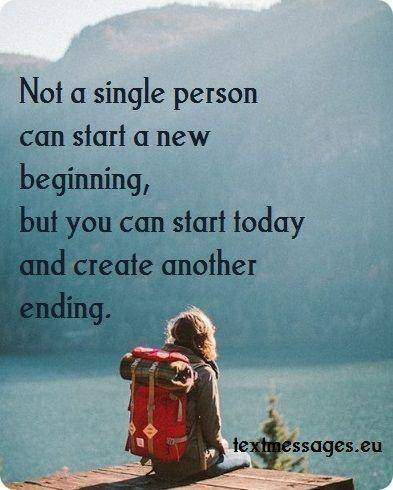 Not a single person can start a new beginning, but you can always start today and create another ending. Sometimes we lose faith and inspiration. Sometimes it’s really hard to keep going when there’s no motivation, no reasons for it. But despite it all, we still should try to do everything that is possible to conquer our happiness. Keep going! Bad days happen to everyone. There’s nothing you can do, so just let it out, make some tea, meet with your friends or simply relax. Everything will be okay. They say an ability to work hard distinguishes a man from other animals. Indeed, only we can be devoted to our work so much and to invest so much energy and time in what we do. Carry on! Everything in life comes and goes, that’s why you need to let it go and move on. When one leaves, another comes. It’s a simple and eternal law of life and you have to learn it. Don’t worry that you had a bad day. Even a hundred of bad days is worth waiting for a good and happy day. 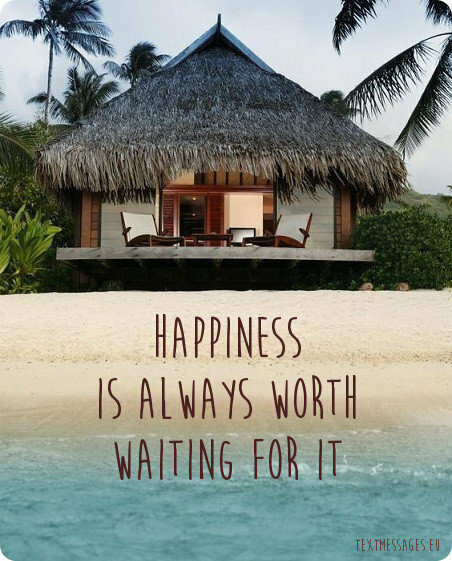 Happiness is always worth waiting for it. Hard work is a thing which either makes you stronger or breaks you. If you work hard enough and don’t give up despite all failures, you will see that it all was worth the effort. Bad days come to go, but good days come to stay in our memory forever. Smile is the best weapon against bad luck, so smile at the world and one day it will get tired of hurting you. You shouldn’t stop fighting no matter how many obstacles there are on your way. If you really wish something try to get it your best. Keep going! We go through hard times not because life wants to punish us. The real reason is that life loves us so much that wants to make us stronger and wiser. Hard times are not a curse – it’s a gift. Bad days are like rainy days. They come and eventually go, and after that sunny days come. 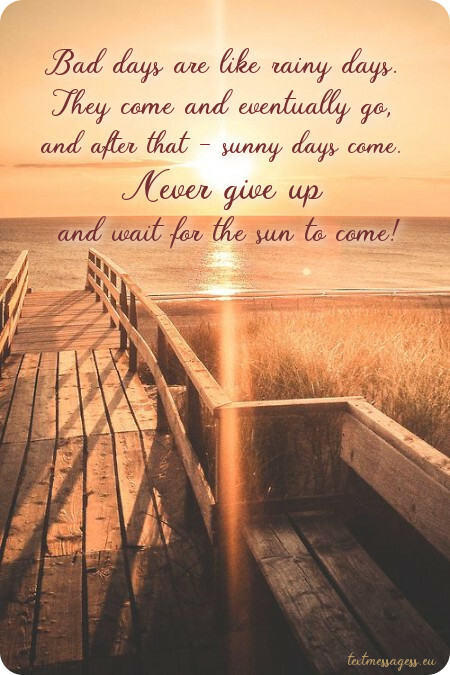 Never give up and wait for the sun to come! Depression is a thing you can’t control, it may hit you at 3AM or it may hit you at 3PM when you’re with your friends in the middle of a joke. But whatever happens, you should never ever give up. Fight until you are finally happy! The happiest people are those who look at things wisely. Don’t be a hostage to the situation, don’t let it make you feel miserable – control it yourself, move on! We all are people and from time to time we get tired. We start to get the urge to give everything up, but we should keep in mind that it’s just a life’s trick and we should resist the temptation to give up. Just keep going and everything will be okay. Only fools don’t go through hard times. Clever people always face obstacles on their way. And the way they deal with them, shows how strong they are. Never give up on yourself, even if you think that your life is over. Luck will come and pain will go away, it just needs a little time! I know that you had a bad day, but you just have to deal with it. Make some coffee, relax and just read a book or turn your favourite music on. Everything is going to be fine. Yes, you have every right to spend some time crying and longing, but don’t take too long, move on. Otherwise you can miss all the good things that will come into your life while you’re upset. Life is wise and gives hard times to the strongest people, because life knows that others are already crawling on their knees. You can do it, keep it up! Depression is a phase on the path of becoming a happy person, so don’t be afraid. Sometimes we really need to go into a cocoon to become a beautiful butterfly, after all. Only the weak give up. The strong keep going and you, my friend, are truly strong. Don’t despair if something goes wrong – it will make you only stronger. Never forget the reason why you started all this work. Remember that everything will pay off in the end, even if you think it won’t. I know that sometimes it’s hard to stand up after you fell down, but trust it’s all worth it. Even if you think your life is over, just stop for a second and think about tomorrow. Maybe tomorrow will be the day when your life will change and you will become happier. Never give up, because every time when you’re about to, a miracle might happen. You have to remember that bad day is not the end of the world, because tomorrow is another day and it may be the best day of your life! When life gets tough there’s only one thing you have to remember: keep going! This is the only way to handle all difficulties. Be strong. Hard times hit everyone, but only the strongest survive. I know you are strong and I know you can do it! I know you’re desperate now, but you have to move on, even if the future is uncertain right now. Trust me, there will be a bright future waiting for you. Sometimes hard work can be way too hard, but it is always worth the effort. I know sometimes you want to give up, but every time you’re about to just remember how it started. It’ll give you strength. Never doubt a friend who has gone through the same thing. He knows how it goes and how to help you, because friends are people who can help you with any sort of depression. A bad day is a little nuisance, but not a horrible tragedy. Everyone has rainy days, but the sunny days make up for them, so make sure you have more sunny than rainy days! It’s all in your hands. Some have hard times and some have harder times, but everyone eventually gets out of their misery and just get happy. You have to fight and eventually you will be happy too! Just as bicycle can stand on the ground only when it moves, we, people, also remain viable only when we keep going. Carry on no matter what and eventually you’ll find your own way. Moving on is just another part of life you have to do. It doesn’t matter whether you broke up with someone or someone special left you, you have to move on. Hard work is worth every second of your life, because it always pays off, even if you think it doesn’t. By working hard, you are not going to lose, you will only just win and gain experience. Keep working and never give up! Imagine you are the sky and depression is like clouds. They come and go, but you will still be here… Remember it’s only a bad day or week, not a bad life. You will get through this! Everyone has bad days, bad weeks or even months, but it’s okay. Just wait a little bit and you’ll see that bad times are always followed by good times. Everything will work out. Everyone has hard times, and everyone has their own battles, so never judge someone for what they did, you might just not know why they did it. Keep in mind that it is going to be okay, even if you think the world is against you, or that luck is never on your side, trust me, you will survive, because as they say, “A flower grows every time it rains”. Everyone has to move on, whether you like it or not. As they say, when one door closes, another opens. There is an old saying, “Hard work never killed nobody”. You should know that the more you work the more experience you have. Never ever give up, especially when you’re almost there! Every time when you’re about to give up, just remember what a long way you have come. You can’t give it all up halfway. Keep going and you’ll see that something you seek will wait you round the next corner. If you wake up in the morning, look outside and see rain, clouds, darkness and it all makes you think how bad your life is, do not despair. It’s not a bad life, it’s just a bad day. You’ll get through this and everything is going to be okay very soon. But don’t forget to learn the lesson. Sometimes the worst periods of our life put us into a direct path to the greatest times of our life. So don‘t worry, just turn the page and enjoy your life! Time flies… It was the bad news. And the good news is: „You are the pilot!“. Things will get better! Some days are stormy, but it cannot rain forever! Some people achieve in life much more than the others. How can they do that? They can, because they have a strong belief that they can. If you wish to succeed, your desire to win has to be greater than your fear to lose. Don‘t believe anyone who tells you are weak, cause everyone has a great reserve of inner strength. Life is full of surprises. It happens that you lose, but somehow you win. Therefore do your best to enjoy every moment of your life so that you won‘t regret about anything. make sure that you‘ll never shed a tear for the same reason again. Don‘t waste your time looking back at your past, just learn your lessons and go forward for the new opportunities in life. Sometimes all you need is to relax, take a deep breath, let go all your worries and live in the current moment. It‘s amazing when you find out that you still can surprise yourself. It makes you wonder what else are you capable of.